The chapel dedicated to Our Lady of Lourdes is situated on a promontory overlooking Mġarr Harbour. It enjoys spectacular views of the the harbour, the Gozo Channel and the Island of Malta. A statue of the Virgin Mary of Lourdes sculpted by Antonio Busuttil was placed in a natural cavity beneath the promontory on 25th March 1879. It was blessed by Bishop Pietro Pace on 3rd June 1888. On that occasion the Bishop urged devotees to help him raise a chapel. The foundation stone was laid on the 10th June 1888 and it was opened and blessed on 27th August 1893. It was consecrated on 17th February 1949. 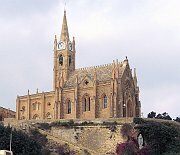 The chapel,designed by Emmanuel Galizia and built by the mason Wiġi Vella of Żebbuġ, has a Gothic style with a steeply pitched roof, lance windows and a series of buttresses topped with pinnacles. A circular rose window adorns the gable over the main door while, at the other end, a square tower is topped by a tall, slender spire. The tower has a set of five bells and at its top, immediately under the spire, there are four clock faces. Inside, the chapel has a ribbed, Gothic vaulted roof, and is dominated by a statue of the Virgin Mary of Lourdes. This statue was sculpted by Carlo Darmanin and donated by Karolina Mamo-Bruno on 17th September 1893.